St. Jude Medical, Inc. (NYSE:STJ), a global medical device company, today announced CE mark approval for full-body magnetic resonance (MR) conditional labeling of the Proclaim™ Elite Spinal Cord Stimulation (SCS) System. With the latest approval, patients who receive the Proclaim Elite SCS System can now undergo full-body magnetic resonance imaging (MRI) diagnostic scans within approved parameters. The full-body MR conditional labeling is the second upgrade available to patients outside the United States implanted with the Proclaim Elite System, following a 2015 approval for MR Conditional labeling for head and extremity MRI scans. With the latest approval, patients living with chronic pain who have been implanted with the Proclaim Elite SCS System may now undergo full-body MRI diagnostic scans within approved parameters while retaining access to the treatments they need, such as the St. Jude Medical BurstDR ™ stimulation. "Providing patients with a multitude of therapy options in one device has positively impacted the way we treat chronic pain patients today," said Dirk Rasche, M.D., functional neurosurgeon, University Hospital of Schleswig-Holstein, Campus Lübeck, Germany. "Patients now do not only have access to both traditional SCS and BurstDR stimulation, they can also safely undergo MRI scans, a significant improvement for future neuromodulation therapy and diagnostic options." The Proclaim Elite SCS System offers patients a combination of the convenience of a device that doesn't require recharging while offering access to St. Jude Medical BurstDR stimulation technology. BurstDR stimulation is a physician-designed form of SCS clinically proven to provide patients superior pain relief (as compared to tonic stimulation) by reducing their physical pain and addressing their emotional response to pain as measured by visual analogue scale (VAS) scoring. Unlike other stimulation designs, St. Jude Medical BurstDR stimulation works differently, utilizing intermittent "burst" pulses designed to mimic the body's natural nerve impulse patterns. St. Jude Medical was the first company to provide patients suffering from chronic pain a single device featuring upgradeable and recharge-free therapy solutions. The company designed the Proclaim System with patient-centric solutions in mind. 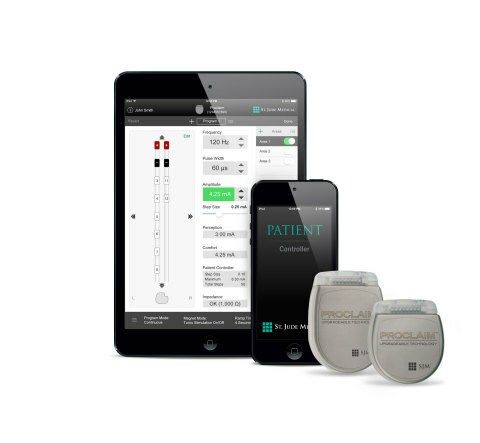 In addition, the Proclaim Elite SCS System's Bluetooth ® wireless technology allows clinicians to program and adjust their patient's SCS therapy with an Apple ™ iPad mini ™ mobile digital device. "Historically, the need for future MRI scans could act as a barrier to patients who may benefit from SCS therapy," said Dr. Allen W. Burton, medical director of neuromodulation and vice president of medical affairs at St. Jude Medical. "Our new labeling for the Proclaim Elite SCS System ensures that patients can receive the treatment they need, while having peace of mind knowing their SCS system can be safely scanned with the diagnostic imaging they require." Nearly 95 million Europeans suffer from chronic pain, and the condition costs European health care systems a combined total of 300 billion Euro annually due to associated medical costs, lost work days and social security and welfare payments. SCS therapy can offer many patients meaningful pain relief and improvements in quality of life, yet for some patients the need for future MRI scans can act as a barrier to SCS therapy. Full body MR-conditional labeling for the Proclaim Elite System was also recently approved by the Food and Drug Administration in the United States. Note: Apple and iPad Mini are trademarks of Apple, Inc. Bluetooth is a trademark of Bluetooth SIG, Inc.
St. Jude Medical is a leading global medical device manufacturer and is dedicated to transforming the treatment of some of the world's most expensive epidemic diseases. The company does this by developing cost-effective medical technologies that save and improve lives of patients around the world. Headquartered in St. Paul, Minn., St. Jude Medical employs approximately 18,000 people worldwide and has five major areas of focus that include heart failure, atrial fibrillation, neuromodulation, traditional cardiac rhythm management and cardiovascular. For more information, please visit sjm.com or follow us on Twitter @SJM_Media. This news release contains forward-looking statements within the meaning of the Private Securities Litigation Reform Act of 1995 that involve risks and uncertainties. Such forward-looking statements include the expectations, plans and prospects for the company, including potential clinical successes, reimbursement strategies, anticipated regulatory approvals and future product launches, and projected revenues, margins, earnings and market shares. The statements made by the company are based upon management's current expectations and are subject to certain risks and uncertainties that could cause actual results to differ materially from those described in the forward-looking statements. These risks and uncertainties include market conditions and other factors beyond the company's control and the risk factors and other cautionary statements described in the company's filings with the SEC, including those described in the Risk Factors and Cautionary Statements sections of the company's Annual Report on Form 10-K for the fiscal year ended January 2, 2016 and Quarterly Report on Form 10-Q for the fiscal quarter ended October 1, 2016. The company does not intend to update these statements and undertakes no duty to any person to provide any such update under any circumstance.